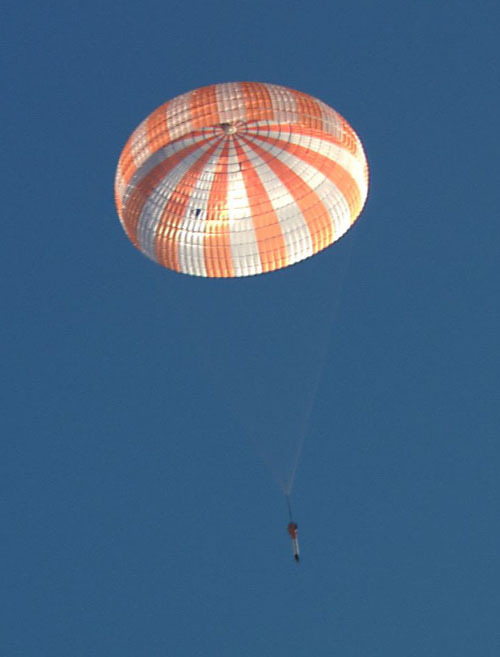 It is expected that NASA will be using a cluster of three ringsail parachutes during the terminal descent of the Orion spacecraft. These parachutes, referred to as the "mains", are being designed to support a weight of approximately 15,000 lbs at a steady descent speed of approximately 25 ft/s. 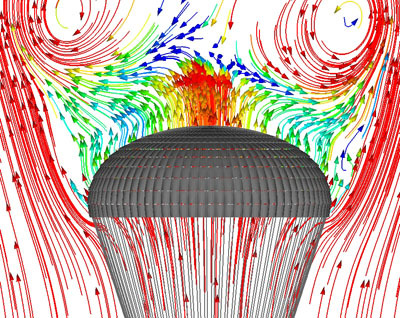 Each parachute has 80 gores and a nominal diameter of about 120 ft. It has 4 "rings" and 9 "sails" (see [8, 9] for the terminology). 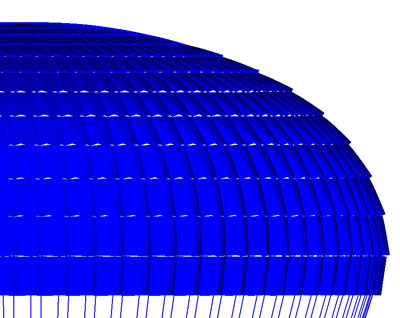 To better understand the performance of the mains, we are modeling a single main parachute, carrying one third of the total weight of the space vehicle. We simulate the offloading, which involves dropping the heat shield prior to landing, and the drifting under the influence of a side wind at 12.5 ft/s. The numerical methods used in these computations were introduced and implemented on parallel computing platforms by the T*AFSM. The set of numerical methods introduced by the T*AFSM over the years and used in this computation includes the DSD/SST formulation [1-4], the quasi-direct FSI method [5, 6], the stabilized space-time FSI (SSTFSI) technique , and a number of special FSI techniques [7-9]. 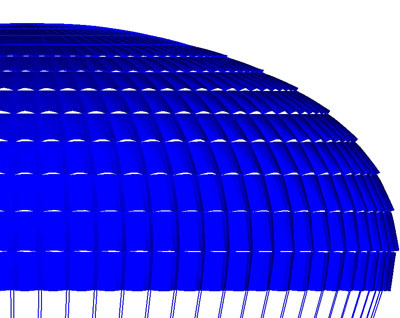 Among the special FSI techniques used in the computation are the FSI Geometric Smoothing Technique (FSI-GST) and the Homogenized Modeling of Geometric Porosity (HMGP) (see [8, 9]). The computations were carried out on the ADA system at Rice University. For more details on these computations, see [8, 9]. Fig. 1. 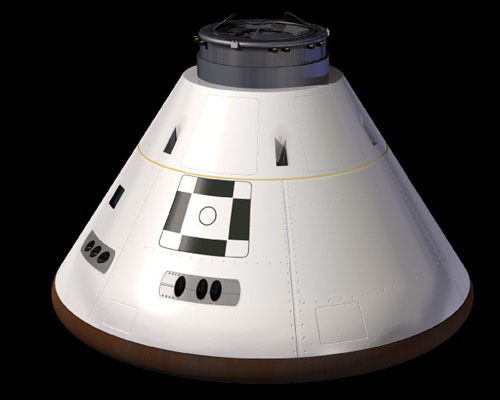 Orion spacecraft (http://www.nasa.gov/mission_pages/constellation/multimedia/orion_contract_images.html). Fig. 2. Orion spacecraft main parachute. Reefed (left) and full (right) configurations (http://www.nasa.gov/mission_pages/constellation/multimedia/parachute_tests.html). Fig. 3. 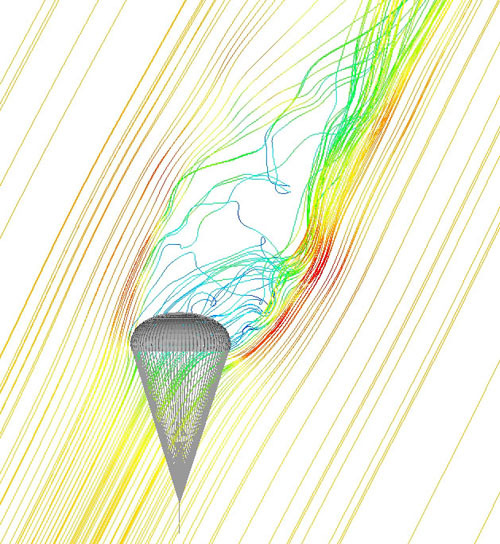 Parachute shape and flow field before and 6 s after the heat shield is dropped. For details, see [8, 9]. Fig. 4. 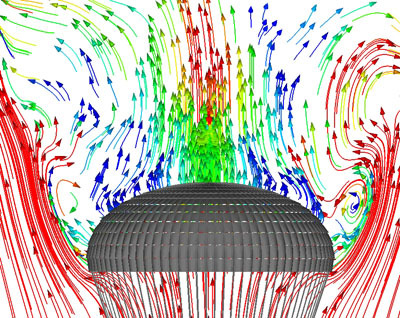 Flow past the drifting parachute (side wind = 12.5 ft/s). For details, see [8, 9]. Fig. 5. 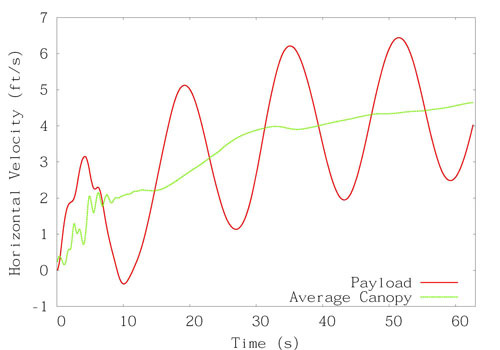 Horizontal velocity for the drifting parachute (side wind = 12.5 ft/s). For details, see [8, 9].